Dear Readers, we are presenting Daily Current Affairs for All Exams- 19th September 2016. 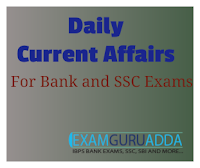 Daily Current Affairs for All Exams- 19th September 2016. 1. President Pranab Mukherjee has appointed former IAS officer Alka Sirohi as chairman of Union Public Service Commission (UPSC) as per Article 316 of Constitution. She will replace Deepak Gupta who demits office on 20th September 2016. She will be in office till completion of her term as member on January 3, 2017. 1. Hearing-impaired Indian shooter Priyesha Deshmukh won the bronze medal in her first-ever international competition at the first World Deaf Shooting Championships. 2. The Championships was held in Kazan, Russia from 7 September to 15 September 2016.Deshmukh won the bronze in the 10m air rifle category. 1. Indian shooters clinched seven medals, including three gold, on the opening day of the International Shooting Sport Federation (ISSF) Junior World Cup for pistol, rifle and shotgun at Gabala in Azerbaijan. 2. A total of 279 junior athletes, representing 27 countries, are battling it out in 18 events. Subhankar Pramanick: He clinched gold medal in 50-metre rifle prone event. The Indian shot 205.5 overall to finish top of the podium. Czech Republic's Filip Nepejchal (205.2) followed in second position, while Romania's Dragomir Iordache (185.1) was placed third at the end of the finals. Subhankar, along with team-mates Fateh Singh Dhillon and Ajaey Nithish, also helped the Indian team to win a silver in the event. Sambhaji Patil: He won the junior men's 25-metre standard pistol event by shooting 562 to easily beat Australians Sergei Evglevski and James Ashmore. Sambhaji along with compatriots Gurmeet and Rituraj Singh helped India to win the team gold. The other medals won by India on the day included a silver in the junior men's team rifle prone and two bronze medals. In the year's first Junior World Cup in May 2016 at Suhl, Germany, the Indians had finished fourth with an overall tally of three gold, four silver and three bronze medals. 1. Pulitzer-winning US playwright Edward Albee passed away following a brief illness in Montauk, New York. He was 88. 2. He authored many of the masterpieces such as Who’s Afraid of Virginia Woolf? 1. China and Russia have carried out joint naval exercises dubbed as Joint Sea-2016 in the resource-rich South China Sea (SCS) off China’s southern Guangdong province. 2. The exercises follow a spike in tensions after Permanent Court of Arbitration in The Hague rejected China’s claims in the SCS and slammed it for causing environmental damage there. 1. A mega unit of Patanjali Herbal and Food Park is to be set up in Nepal, Yoga guru Baba Ramdev announced on Sunday during Nepal Prime Minister Pushpa Kumar Dahal’s visit to the Patanjali processing unit in Haridwar. 2. Mr Dahal, in India on his first official visit abroad after being sworn in as prime minister, visited Baba Ramdev’s Haridwar-based Patanjali Food and Herbal Park. 1. State-owned term lender IFCIwill sell its entire stake in Assets Care and Reconstruction Enterprise Limited (ACRE) to Axis Bank for Rs 22.72 crore. 2. In January this year, IFCI had informed about its decision for disinvestment of entire stake of the company in ACRE. 3. ACRE helps banks and financial institutions clean up their books through acquisition of non-performing financial assets.